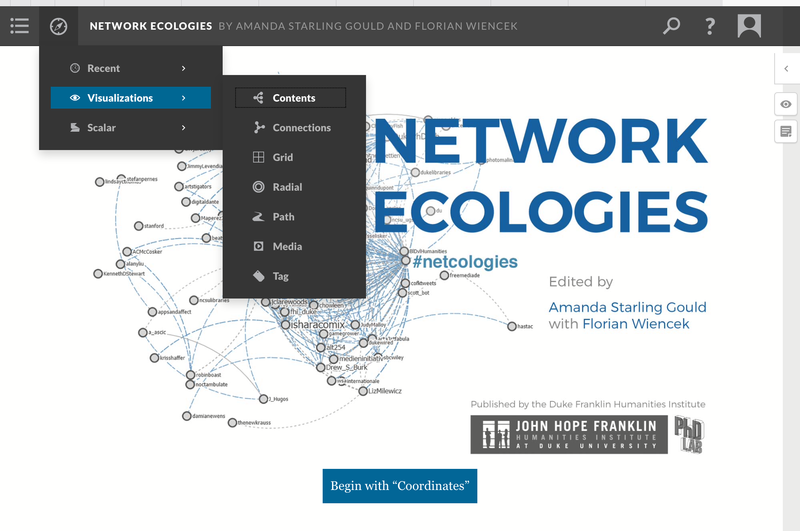 The Network Ecologies digital Scalar publication is the culmination of a five-year, multi-format, interdisciplinary venture to curate a dynamic scholarly digital publication that combines the viability and esteem of a traditional scholarly print publication with the affordances of the digitally-networked medium. The project began with an online forum where invited scholars and professionals created a ‘network’ of content by posting prepared provocations and commenting on those of fellow contributors. The next year, these thinkers, along with a few impressive additions, met in person for an exciting two-day symposium at Duke University. Presentations included contributions from an architect, a data scientist, a media philosopher, a multimedia artist, a classicist, a speculative maker lab, and a pair of game designers. 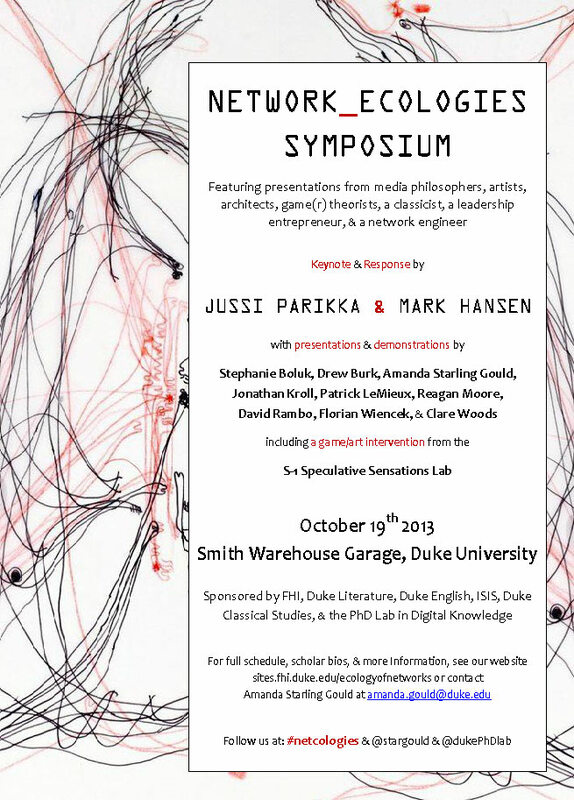 They were followed by a keynote media theorist Jussi Parikka with a response from media theorist Mark B.N. Hansen. These first two stages were designed not only to facilitate interdisciplinary scholarly communication but also to create and gather content, all of which you'll find here, for a digital scholarly publication. Following the Symposium, I released a new public call for projects so that we could network the initial online and in-person conversations with new scholars. Each accepted essay underwent a ‘networked’ peer review process wherein each of our authors anonymously reviewed another of the accepted pieces. This review system successfully facilitated cross-talk between the projects, and between the authors who were introduced afterward, and we saw inter-project linkages emerging—some deliberate and some subtle—in subsequent revisions. Once ready to begin crafting the publication, I recruited Florian Wiencek—a talented designer who had participated in the early Network Ecologies events during his time as a Duke Lecturer visiting from Jacobs University Bremen—to be my publication design partner. Our collaboration began with a week-long design sprint which we live-blogged on our Network Ecologies website so that would share our process as it was in-process. Florian returned home after that first week and since then, our partnership has been entirely transcontinental and fully digital. In 2015, we translated our design ideas into a presentation called "Traversing Networks of Complexity. From Database Artworks to Contemporary Networked Publications" that Florian presented at the "Digital Abstractions" conference at Jacobs University Bremen. In this presentation, our diverse design positions, which merge and manifest in this publication, are made clear: Florian discusses our publication as data and as such traces its lineage through database art and complex network design; I present the project as a creative-critical interrogation into the theoretical and scholarly implications of the digital on rigorous scholarly publication. 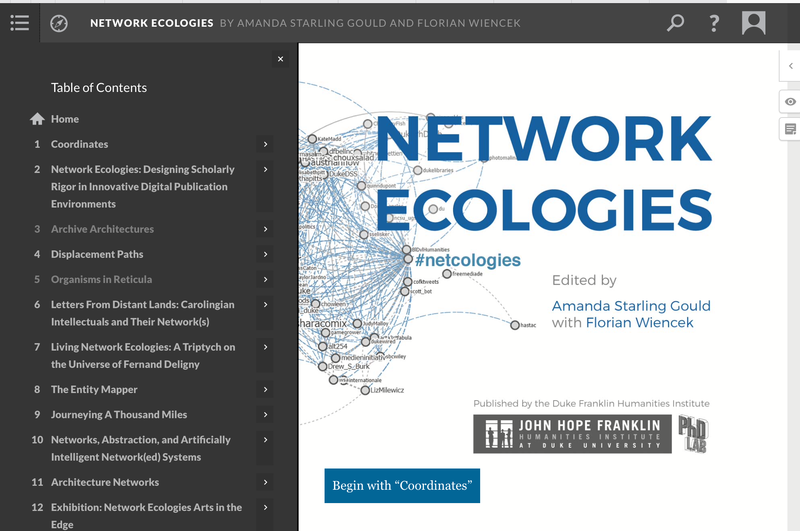 An onsite gallery exhibit of interactive transmedia art at Duke University, which I called Network Ecologies: Arts in the Edge Exhibition, found its way into the project as I worked through methods for visualizing our artistic publication contributions. Two of our submitted essays were authored by visual artists and I reasoned that if we wanted to really push the limits of an innovative, dynamic publication, we might try doing so by having a live—even augmented by AR elements—exhibition of their works. This too resulted in a new Network Ecologies collaboration when the artists from the exhibit decided, at the exhibit opening no less, that Rebecca Norton would shape a new piece that would creatively capture and digitally remix the full gallery show itself. We set out to create a 'networked publication' and we believe we've done just that. We have content ranging from text-based essays to a visual art 3D scanning documentary project that was created specifically for our publication. You'll find transmedia essays on art, technics, data visualization, book-making, theory, mentorship, architecture, network engineering, gaming, and capitalism. You'll find tweets, videos, text, and tools. You’ll even find a garden gnome or two lurking throughout. Grounded by way of ‘Coordinates,’ the publication is organized into four sections: Positions, Tools, Provocations, and Exhibitions. Though distinctly named, the sections deliberately merge (or network) into and out of each other. Positions loosely take the form of the 'traditional' essay but each also includes dynamic elements and interlinking annotations that allows readers to slip into other sections of the publication. Provocations began as blog posts during the first stage of the Network Ecologies project and are here represented in their various forms as notes, translations, arguments, and interviews. 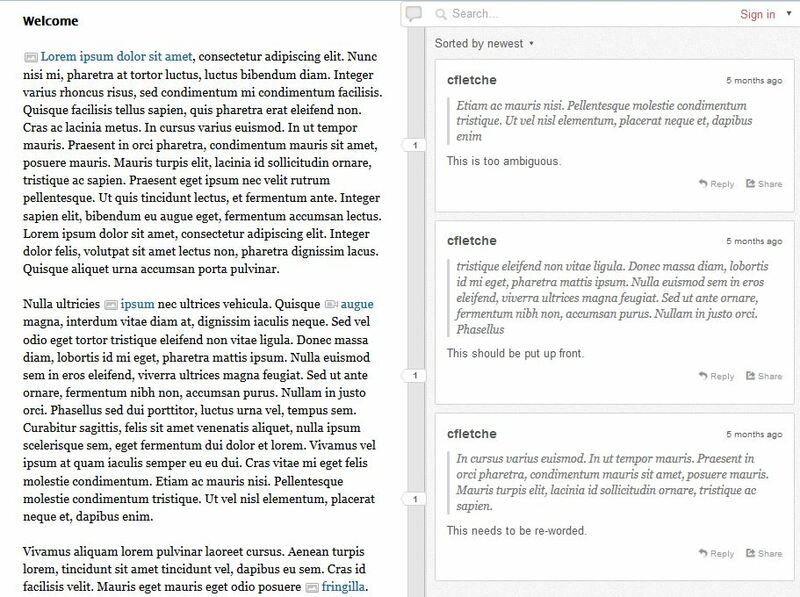 Our Tools section now only features one, but we hope in the future will feature many innovative textual networking and digital/digital humanities tools. 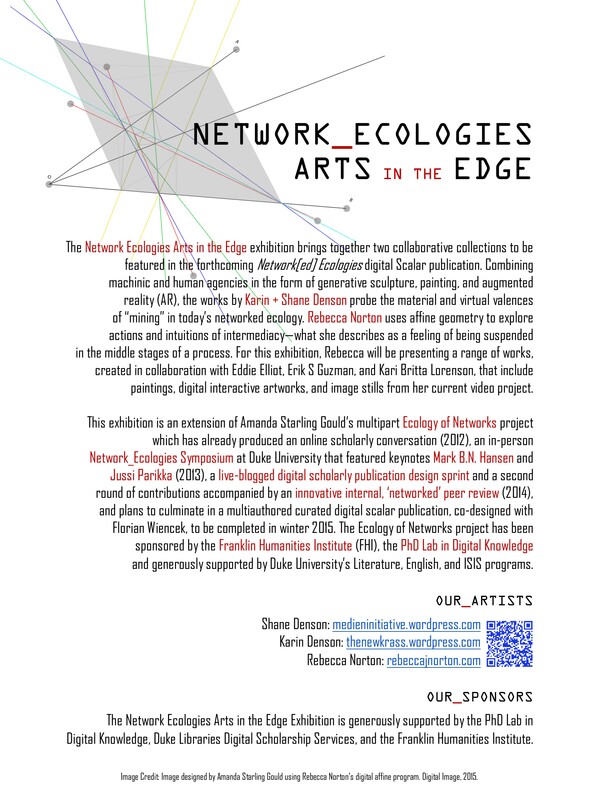 In Exhibitions you’ll find the Network Ecologies: Arts in the Edge exhibit as well as a video gallery of the Network Ecologies Symposium. We’ve activated Hypothes.is as a referential overlay that opens the published content to public comment and collaboration, and we encourage users to extend the network we’ve started here by joining the hypothes.is conversation in the margins. With Hypothes.is, you can comment at the line, paragraph, and individual word levels and anyone with a hypothes.is account (which is painless to establish) can contribute. Please see Scalar's helpful introduction and how-to for its Hypothes.is feature for more on how to use this powerful add-on. The book is also already annotated by the authors themselves as several chose to submit reflections, critiques, and intertextual comments that we've included as interlinking annotations. You'll find too, as I hint above, points of linkage that I've designed into the pages that allow readers to slip, either deliberately or accidentally, into companion articles and media content throughout the book. If you are new to Scalar, you may find the navigation buttons top left useful: the far left (the ≡ button) displays a navigable Table of Contents and the compass icon gives you several options for (re)viewing the content as data visualizations. The goal of this project was for each of us to bring our own research—developed and delivered in our own unique disciplinary vernaculars—together to converge around a shared concept. The assumption is that through transdisiplinary co-mingling and collaboration, both our individual research projects and the Network Ecologies publication, as a living research hub, can gain new dimension. We hope that by putting diverse minds in dialogue with each other, we can facilitate a more robust understanding of the network by way of merging and (re)mixing multidisciplinary understandings. This project was funded by a Graduate Digital Scholarship Initiative grant from Duke’s Franklin Humanities Institute (FHI), in conjunction with Duke’s PhD Lab in Digital Knowledge (PhD Lab) and I would like to thank them for support both financial and otherwise. Many thanks go to the administrators of the grant, especially Chris Chia, and to Duke Libraries Digital Scholarship Services for always being open and generous when I asked them to let me curate a gallery exhibition or organize a two-day symposium with international visitors. I thank my design partner, Florian, for his insights, energy, and expertise as we worked together to craft this publication. We owe a debt of gratitude to The Alliance for Networking Visual Culture for authoring the Scalar platform and for providing guidance from experts, particularly Craig Dietrich who lent a hand (and some code and even a long Skype consultation), more than once throughout our project. Finally I must thank the authors—all brave souls willing to go along with this experiment—and to all of those who contributed behind the scenes along the way.